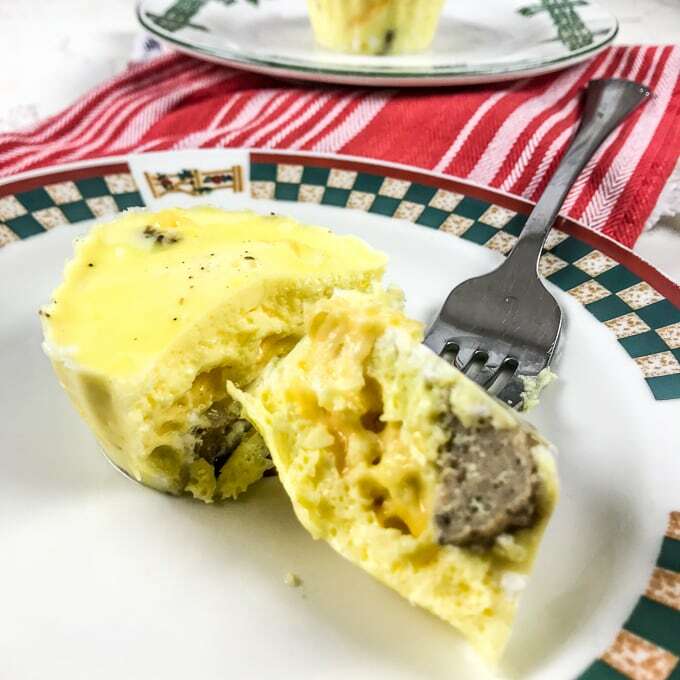 Whip up a batch of these cheesy sausage instant pot egg bites in just 5 minutes! Egg bites will be your new favorite go-to breakfast. They are so easy to make and come out tasting great every time. 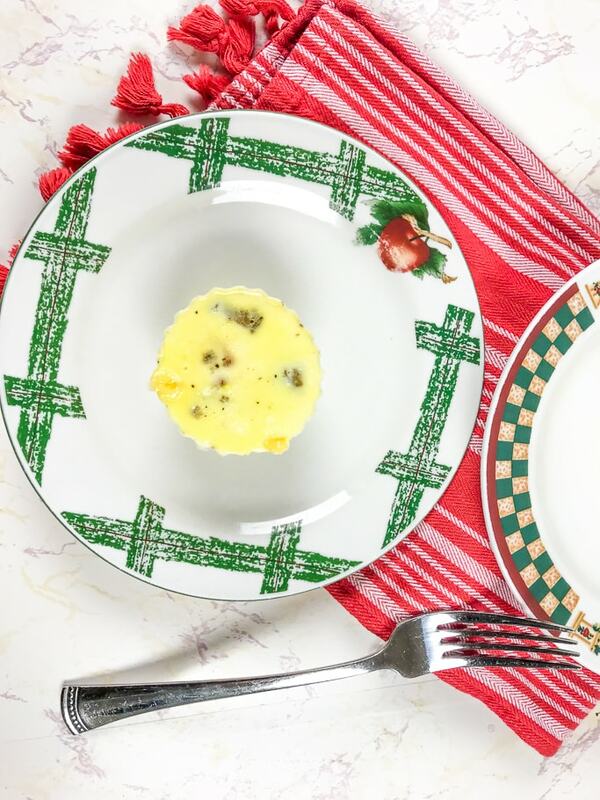 I love that you can make these egg bites ahead of time and store them in the fridge or even freeze them for future use. I have been doing this for years with this easy oven-baked scrambled egg recipe. Now I can make them even faster in the Instant Pot. I also think they taste better in the Instant Pot. Sometimes, the oven-baked version come out tasing rubbery and that can be disappointing. Especially if you are making them in bulk for meal prep. The only downside of making egg bites in the Instant Pot is you can make quite as many at a time. 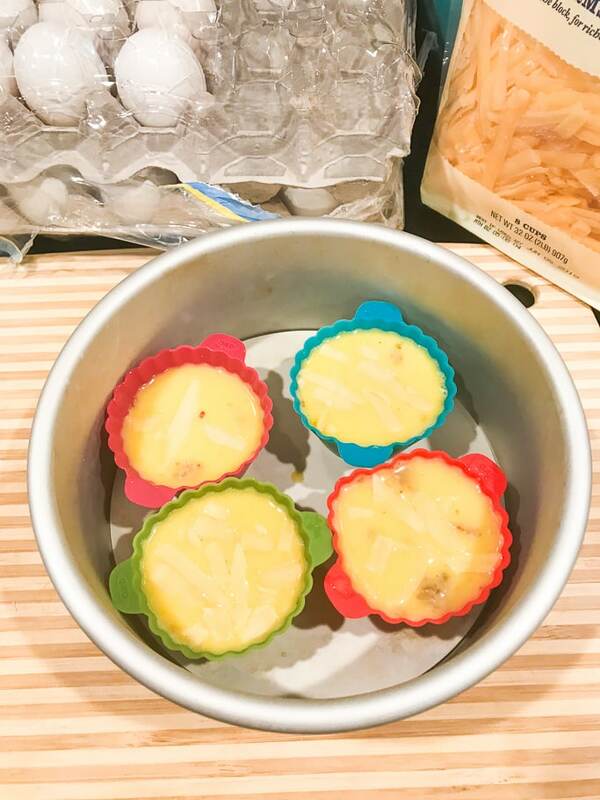 They do sell silicone egg molds on Amazon that fit a few more in, but I have been happy making 4 at a time with my silicone baking cups. As you can see in the picture above, I just stick them in a cake pan. Than I cover it will a paper towel and foil to keep the water out. I use a foil sling to lower them into the Instant Pot and get them out afterward. If you haven’t made a foil sling before, it’s really easy. 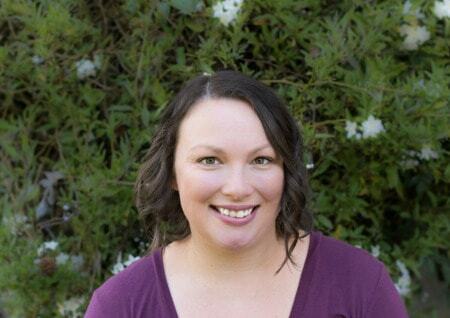 Check out this post for step-by-step instructions. 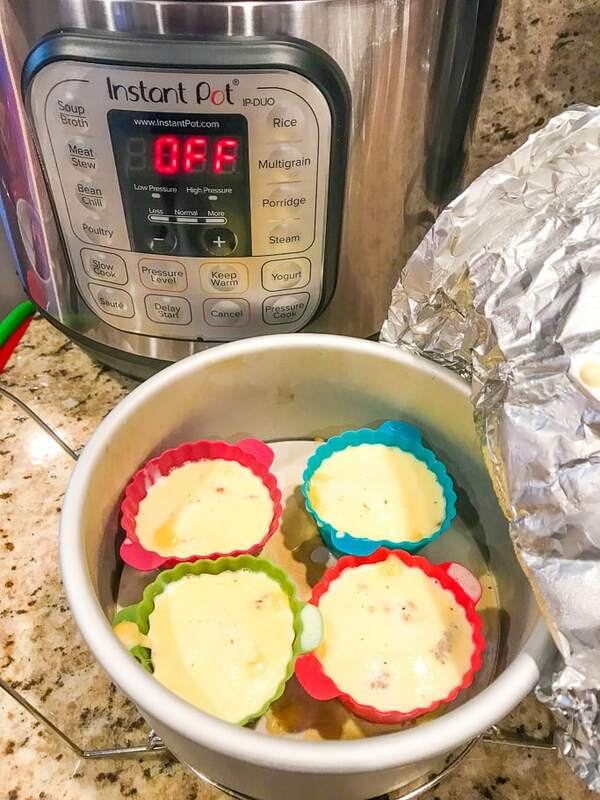 If you do want to make more at a time, I would recommend getting a couple of silicone molds, wrapping them in foil, and stacking them on top of each other in the Instant Pot. Then you could even freeze them so they stay fresh for when you need them. 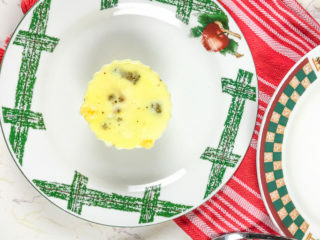 Check out the bottom of the printable instant pot egg bites recipe for freezer instructions. New here? Make sure you sign up for our newsletter and join our Instant Pot Facebook group! The mix of cheddar and sausage is a classic flavor combo that never gets old. I like to use the pre-cooked turkey sausage links in my egg bites to save time. If you are wanting to switch it up and try different flavors in your egg bites, try one of the ideas below. Spray four silicone muffin cups with cooking spray and set aside. In a small bowl, whisk together the eggs, milk, salt, and pepper. Evenly distribute the egg mixture into the four muffin cups. Evenly divide sausage and drop into the egg mixture. Top each with 1/2 tablespoon cheddar cheese. 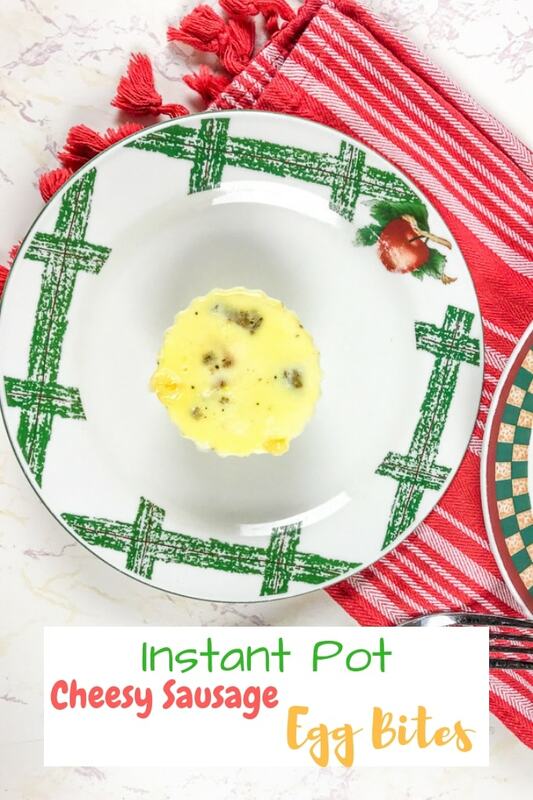 Pour water into the Instant Pot. Place a trivet in the Instant Pot. Place the filled muffin cups inside of a (7-inch) cake pan. Top the pan with a paper towel and a piece of foil crimped around the edges of the pan. Make a foil sling and carefully lower the cake pan down onto the trivet. Press the Manual or Pressure Cook button and adjust cook time to 5 minutes. Let the pressure release naturally for 2 minutes and then quick release the remaining pressure. Remove the foil from the top of the muffin cups and than carefully remove the egg muffins. Enjoy immediately and refrigerate any leftovers. Wrap tightly with a layer of plastic wrap and a layer of foil. Store in a freezer-friendly container or bag. To reheat, unwrap and cook for 90 seconds and 50% power. I am always looking for easy and healthy breakfast recipes that don’t take a lot of time to make. 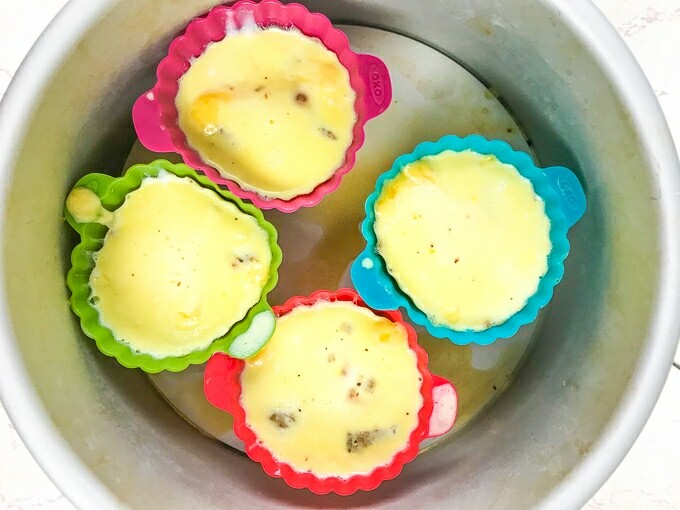 These Instant Pot egg bites are getting added to this list!